The manga not being afraid of making Mamoru look like a bit of a goofball also helps a ton. 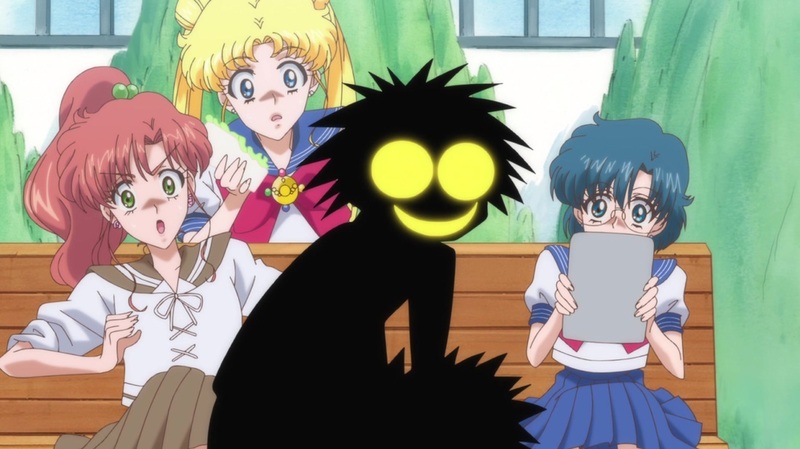 One of the complaints Naoko had with the original anime was that they made Mamoru too goofy. I feel like she might have told the Crystal staff she wanted Mamoru to be cooler, like he is in PGSM, but they went overboard and, like Rei, made him devoid of personality. I heard the anime staff . Said something about Men ruin relationships. I don't mind Mamoru being series though. I know that I am behind a few episodes, playing catch-up, but there are a few things in the past episodes I thought were ok.
One thing, when Umino is under the thrall of the DK, he has Professor Tomoe face. 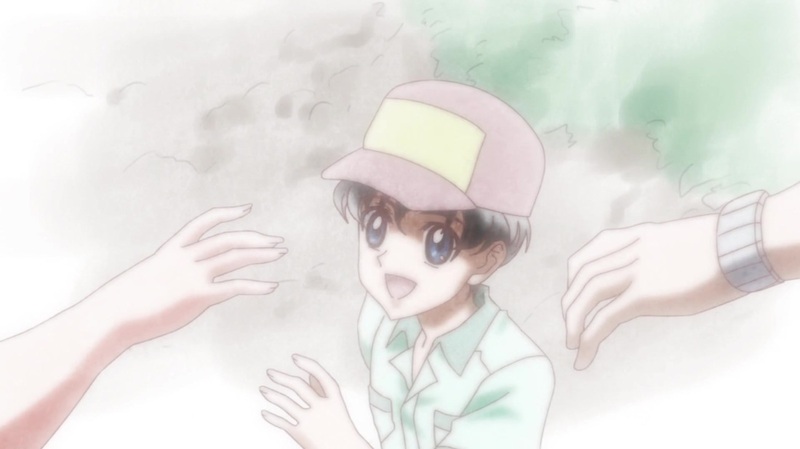 another thing I liked was seeing Mamoru as a child. Now for the current episode, I don't think it was too bad. I little too exposition-y for an anime, but it was alright. The horror enthusiast was kinda sad they toned down Usagi's nightmare of Mamoru's death, so he is only blasted away, no skull exposure, but I understand trying to keep it within kid standards. Nope. Umino has no Tomoe face on the dvd/blu ray version. Sorry guys, but it was hell of a week for me, so I am a bit late with this one. But here we are. Well, this episode was a bit problematic for me. I consider it a decent episode, but I have some issues with it. Here they are. 1. Pacing is off - The transition berween the two halfs was jarring. The first part was very exposition heavy, which would have been fine if they used animation and not slideshow off stills. I especially hated the way Serenity stabbing herself was not animated and the very weird way they showed her dead body over Endimion's. It looked very weird and ugly. 2. This episode was mostly done by Akira Takahashi. He was not a bad animation director, but he didn't even try to follow the character designs at all. It is very jarring because his style was simplified and very inconsistent with scenes done by other animators. That is my problem with him being designer for season 3. I understand why they decided to do it, but him mixed the rest in the first two seasons was very odd. 3. The way the girls just stopped and whined as soon as Venus told them about the generals amids a battle. So cringy. They really committed to make every original material beig strange and opening huge plotholes. This scene makes the next episide unbearbly stupid. So it is wuite obvious here that these guys are brainwashed and they even tried to reach them. Then the very next episode nobody said this is Mamoru being brainwashed, but claimed this is not Mamoru at all and Usagi being all "You are not Tuxedo Mask" feels extremally dumb. They make changes but then keep on adapting the manga, without taking their own changes into account. Some bad fanfiction writing skills. 4. Can we please stop using the cliche red eyes on brainwashed characters. It is just so unimaginative. I much rather liked the vague eyes in the manga and the old show. 5. The other added scene with the generals snooping on Beryl was ok, but ended so anthyclimatically. So it took her three seconds to brainwash them again. If they are this weak, why do you need them in the first place. If she could brainwash so easily she could have brainwashed the girls and get it over with in 5 seconds. In the manga it was just Mamoru and it took time and Metallia's dark energy, so at least for me it was implied she cannot do it on her own. But here she brainwashed the generals with ease. Otherwise a good episode. I liked how Queen Serenity as serene as she is was voiced by the same actress who voiced the obnoxious Esmeraude in the old show. I liked some of the animation in the second half of the episode, but only the movement animation, definetely not the strange downgraded character designs. Overall very mixed feelings for this one. Weren't most of the staff....male? @sapphire91 I loved your thoughts on episode 10.